Re: TATTOOS what ya got? Not a big fan of tats, it seems to be the in thing now especially with younger people . Remember once done there on for life, removing them is dificult, painful, and expensive. I know some that feel the need to remove them now but it's all too dificult so be sure it's what you won't and think about in time to come if you really won't them. Oh well this is just my opinion, and I also know some that are very passionate about their tats and would not be without them. HJ75 Rob wrote: Everybody to their own. I'm another that can take them or leave them, couldn't care less that a person has tatts or not they are just not for me. Love it Don't think I will use that one, pretty sure my life insurance doesn't cover dismemberment by spouse. 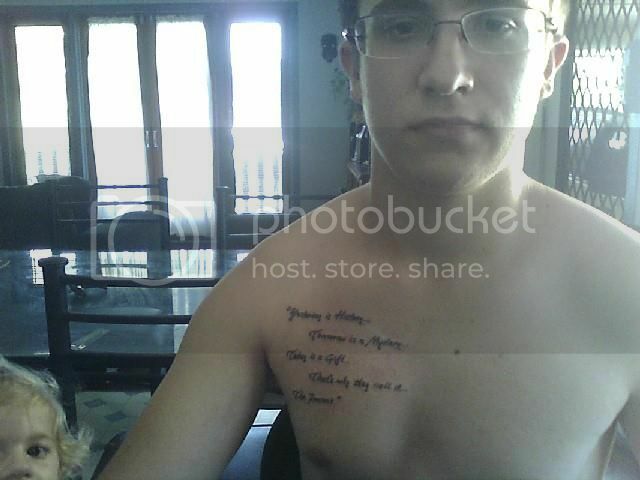 i have a "saying" on my right pectoral. "Yesterday is history tomorrow is a mystery today is a gift thats why they cal it the present"
to get them fixed and ended up half covered.3/4 grand later and still want more. I'm thinking of an oriental 3/4 or half sleeve,gets bloody expensive though. most good tattoo shops won't do it anyway unless you're already covered. i have got 4 at the moment 1 on my left forearm 1 on my left upper arm/shoulder 1 on my right arm/ shoulder and 1 on my left leg will get a couple of photos up when when modern technelogy stops *#%$^&*(# me off haha good old modern technology i like you really. the humour of seeing silly youngsters ruin their lives, thinking they are something special or being tough. trying to prove some futile point and certainly will live to regret that moment. those foolish ones who have those stupid shapes that mean nothing. ^So... do you discriminate or automatically stereotype those who do have them...? By hate, do you mean you simply won't get one, or look down on people who do...? As I've stated, I don't care either way if someone has them or not... But I certainly don't look down on people who don't..
Why come into a thread about tattoo's if you don't like them? Everyone likes different things. But i guess, 98% of people are judgemental so oh well, aye.